Somehow, the cord to the external temperature probe got ripped the out of the temperature display in the bedroom. My wife insisted on us purchasing a new thermometer but as an engineer I immedietaly saw the opportunity to build hardware and write software. Spending lots of time and resources on “engineering joy” is not something one can do at work but in one’s sparetime the sky is (almost) the limit. 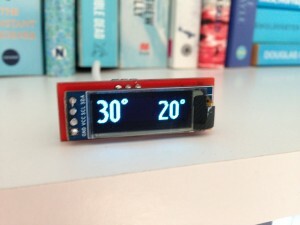 So instead of spending about a dozen Euros on a new thermometer I designed and built a PCB and wrote code which was a lot more fun and educational. And way more expensive 🙂 The result is the Wife OLED that displays the current outside temperature as well as the forecasted temperature in 8 hours. While the morning might be cold, it is nice to know what the temperature will be at lunchtime. Another ESP8266 MQTT OLED display, on the warmest day this summer! Looking at the software side, it turned out most of the work had been done by Nathan Chantrell (and others). 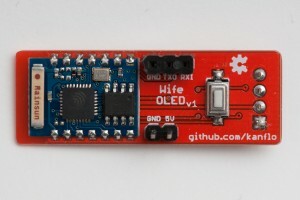 He used a 128×64 pixel OLED display and the driver seemed to originate from the Arduino OLED driver by Adafruit. As I had chosen a 128×32 pixel display the driver needed some work. Also the available fonts where too small to be readable from across the room so I rendered Ubuntu Condensed in 28px and 32px. The larger font will be used for displaying the current temperature and the smaller one for the forecasted temperature. 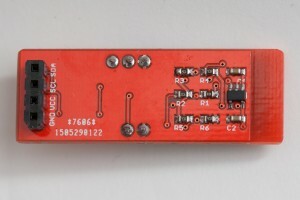 The device subscribes to the MQTT topics `home/temperature/outside` and `home/temperature/forecast` and displays whatever arrives on those topics. The current outside temperature comes from my setup with a Tiny328 node equipped with a DS18B20 probe and a Raspberry Pi gateway (a future post). The forecasted temperature is pulled from the open data feed of the Swedish Meteorological and Hydrological Institute (SMHI) using the script get-weather-smhi.py. The HW schematics (and gerbers!) as well as the SW is found on GitHub. A note one year later: The OLED display will start to deteriorate after about half a year. It will still be readable but the pixels get “worn out” and will not be as bright. I would not recommend soldering the display to the PCB for this reason. Nowadays these displays retail at €2.50 on eBay so a replacement now and then is acceptable. Boring back side with regulator and friends.